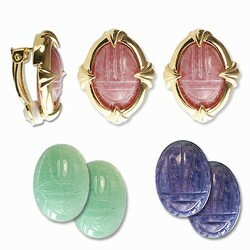 Fashionable Genuine Scarab Clip Earrings that are interchangeable to complement and coordinate with fashionware. A companion product to our Scarab hinge baraclet. Selections included are Blue Sodalite, Green Adventurine, and Rose Rhodenite. Scarab size is 18x13 mm and interchange easily. Earrings are finely gold plated with a confort cushion pad and boxed. With the interchangable genuine scarab stones you essentially get three pair for the price of one. Interchangeable Jewelry are a great buy, you get more for your dollar.